2012 is the year to digitize all your precious analog photo memories, declutter and get organized. Throw away those old photos and keep digital, scanned copies. For all those photos that have been torn and damaged by water, the sun and mold, restore those images back to life and enjoy those special memories for generations. What's the absolute best way to scan all your photos? We created the Family Generation Collection to scan and preserve approximately 10,000 photos! Many of our repeat customers tell us they never knew just how many thousands of analog images they have amassed. 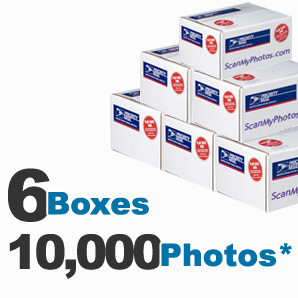 Get all of your photos scanned, digitized and preserved with the Family Generation Collection from ScanMyPhotos.com. Expertly scanned by world-renowned photo imaging professionals at ScanMyPhotos.com. For photo scanning only. No negatives, slides or other media accepted. Box dimensions: 11" x 8.5" x 5.5", includes six prepaid boxes. Fast scanning, typically in 21 business days or less. U.S. domestic only. Sorry, no international orders. For international orders, view our International Services information. Since 1990: We have preserved ten's of millions of photo memories. 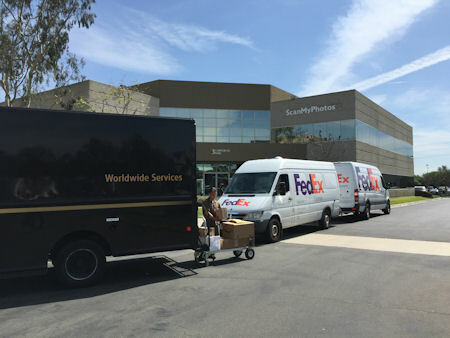 All scanning completed at our Irvine, CA headquarters: Your photos are NEVER shipped out of the country to be scanned. All photos are returned to you: Choose our prepaid options and there is absolutely no additional charge to return your photos; all shipping is 100% FREE.